Lenovo is a global Fortune 500 company and a leader in providing innovative consumer, commercial, and enterprise technology. 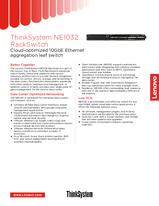 Lenovo enterprise systems deliver industry-leading performance, reliability, and security in virtualized and cloud environments for analytics, database, virtual desktop, infrastructure, and web workloads. Lenovo also offers simplified and extensible systems management tools so you can manage your infrastructure on your own terms. Consistently ranked #1 in reliability and customer satisfaction, the Lenovo enterprise server, storage, and networking portfolio provides the hardware for businesses that never stand still. To learn more about the Lenovo ThinkSystem NE1032 RackSwitch, contact your Lenovo representative or Business Partner or visit: lenovo.com/networking. For detailed specifications, consult the NE1032 Product Guide. Trademarks: Lenovo, the Lenovo logo, Lenovo XClarity, RackSwitch, ThinkAgile, and ThinkSystem are trademarks or registered trademarks of Lenovo. Azure® and Microsoft® are trademarks of Microsoft Corporation in the United States, other countries, or both. Other company, product, or service names may be trademarks or service marks of others. Document number DS0009, published December 8, 2017. For the latest version, go to lenovopress.com/ds0009.